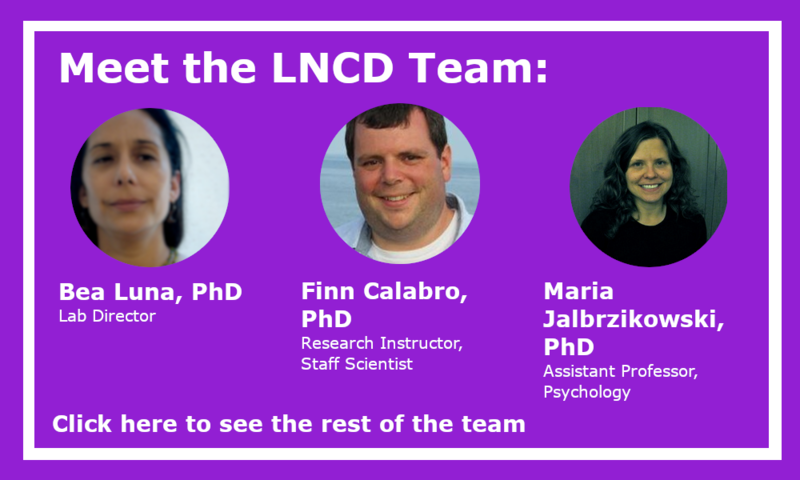 At the LNCD, we use multimodal neuroimaging, such as fMRI, DTI, MEG, and PET, to characterize neurocognitive development during adolescence. Our research focuses on the brain circuitry that allows for higher-order cognition, including networks for voluntary response suppression and spatial working memory. Check out our latest research! Our Lab Director, Dr. Beatriz Luna, accepted a position as the Editor-in-Chief of Developmental Cognitive Neuroscience. The journal publishes theoretical and research papers on cognitive brain development, from infancy through childhood and adolescence and into adulthood. It covers neurocognitive development and neurocognitive processing in both typical and atypical development, including social and affective aspects. Post-doctoral researcher Ashley Parr has joined our lab from Canada! Her areas of focus are: understanding individual differences in the development of cognitive processes throughout adolescence; reward; dopamine; neuroimaging. Would you like to be a part of the process of scientific discovery? We are now giving study participants photos of their own brains! 2 new papers from our lab! Vishnu Murty’s paper, “Age-Related Trajectories of Functional Coupling between the VTA and Nucleus Accumbens Depend on Motivational State,” was published in the Journal of Neuroscience. This article explains that we have found that teen brains experience excitement more potently than adults. When teens are in an excited state, their brain activity in areas associated with excitement in far greater than in adults in an excited state. 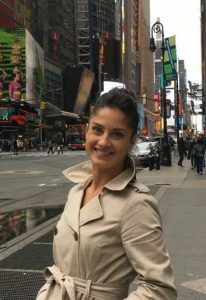 Maria Jalbrzikowski’s paper, “Age-Associated Deviations of Amygdala Functional Connectivity in Youths With Psychosis Spectrum Disorders: Relevance to Psychotic Symptoms,” was accepted into the American Journal of Psychiatry. Maria found that teens are more sensitive than adults, meaning the parts of the brain that regulate and experience emotion are hyperactive in teens as compared to adults. 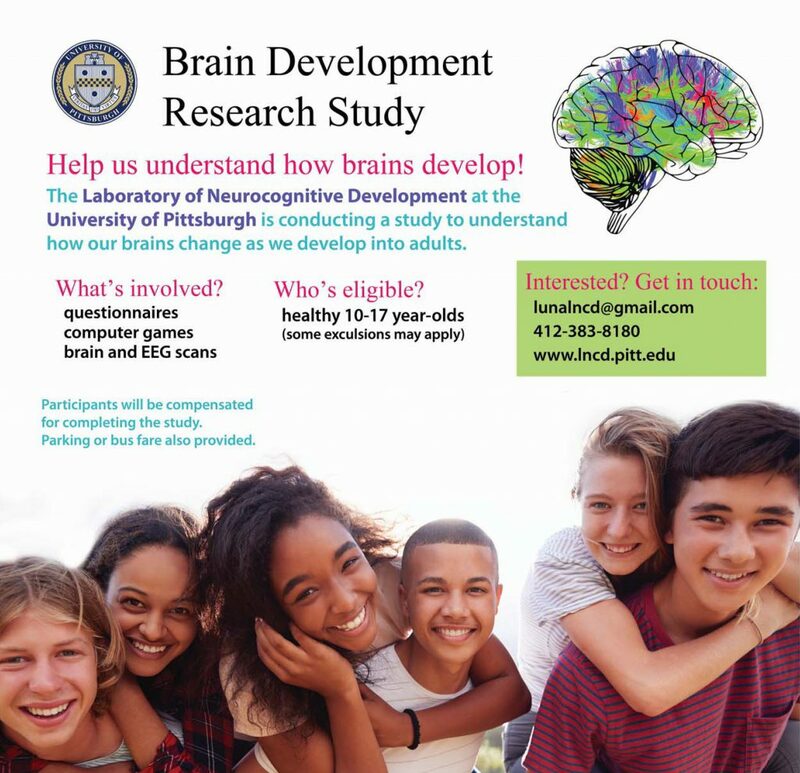 These two papers together provide insight into what is going on in the teen brain as it molds itself to better fit into an adult environment. Please be sensitive with teens because they really are feeling a whole lot! And it’s all a normal part of growing up.